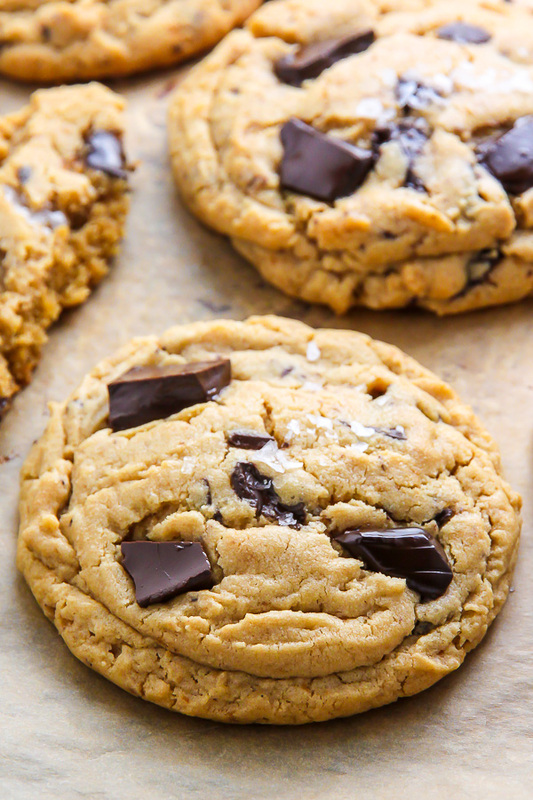 These are the BEST Soft Batch Chocolate Chunk Peanut Butter Cookies! Made with brown sugar, creamy peanut butter, and high-quality chocolate, these cookies are sure to become a family favorite!!! A must try for peanut butter lovers! Hello hello! I’m sharing this post with you a little late in the day, but I’m SO excited to show you these soft batch peanut butter cookies that I just couldn’t wait another minute longer. After endless fails, I finally found our winner. They’re everything you could want in a peanut butter cookie and more! But I digress. Focus, focus! Today’s recipe was inspired by a recent – and much needed – pantry clean out. After discovering a surplus of peanut butter (why do I have 9 unopened jars?! ), making peanut butter cookies with a no-brainer. I also happened to have a ton of chocolate bars, so I decided to chop them up and make these cookies into a delicious chocolate + peanut butter situation. For these peanut butter chocolate cookies you’ll need butter, vanilla, peanut butter, light brown sugar, granulated sugar, eggs, all-purpose flour, baking powder, baking soda, salt, and chocolate chunks. The butter must be at room temperature before creaming. Then you will cream the butter with the peanut butter and vanilla. Make sure you beat these ingredients until they’re nice and fluffy; about 2 minutes. I know that may seem like a long time, but trust me, this step is important. Make sure your eggs are at room temperature, and add them in one at a time. Allow each egg to fully incorporate before adding the next one in. When you add the dry ingredients into the mixing bowl, lightly toss them together on top of the wet mixture before fully incorporating them into the batter. And as always, be sure not to over mix. Although I used dark chocolate in these cookies, you can use milk chocolate, semi-sweet chocolate, or even a combination of both. I like to top each cookie with a few extra chocolate chunks before baking. Too much chocolate…? NEVER. I used Extra Dark Chocolate for these cookies, but like I said earlier, you can use milk chocolate or semi-sweet chocolate if you prefer. The finishing touch is a sprinkle of flaky sea salt. Totally optional but sooooo good. The sea salt adds a wonderful crunch and really helps balance out the flavor. 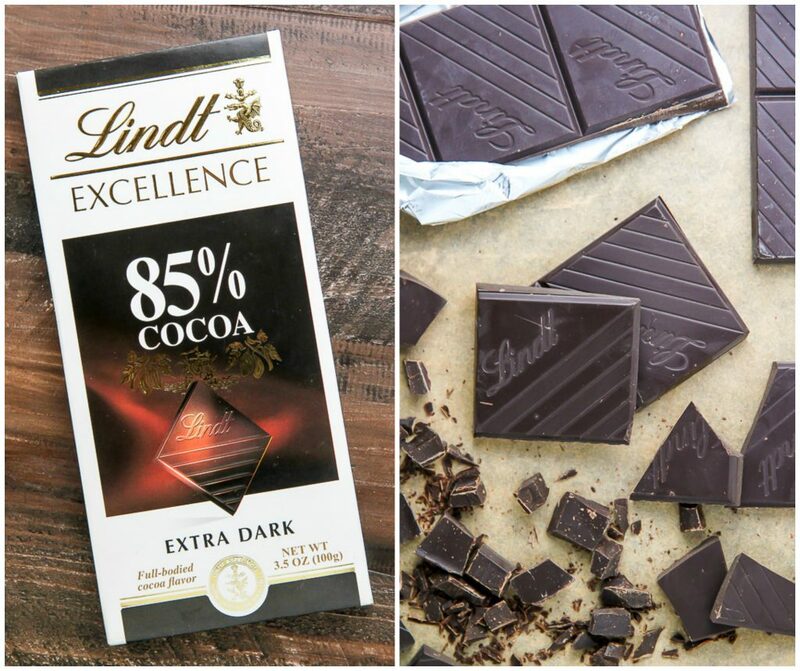 If you like salty/sweet treats, you’ll definitely want to include it. 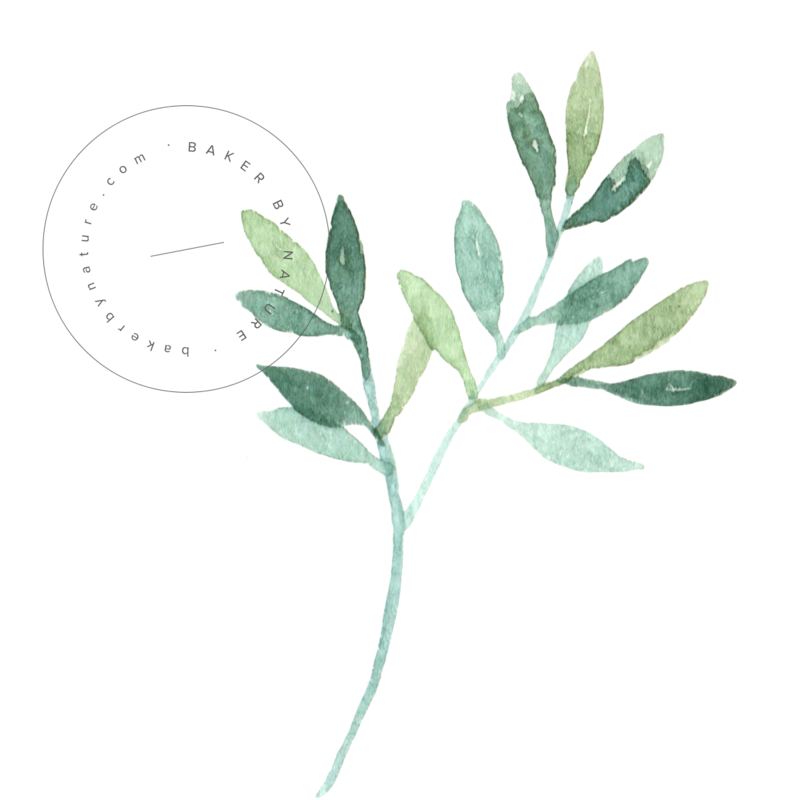 I use Maldon Sea Salt Flakes. Enjoy, chocolate peanut butter lovers! 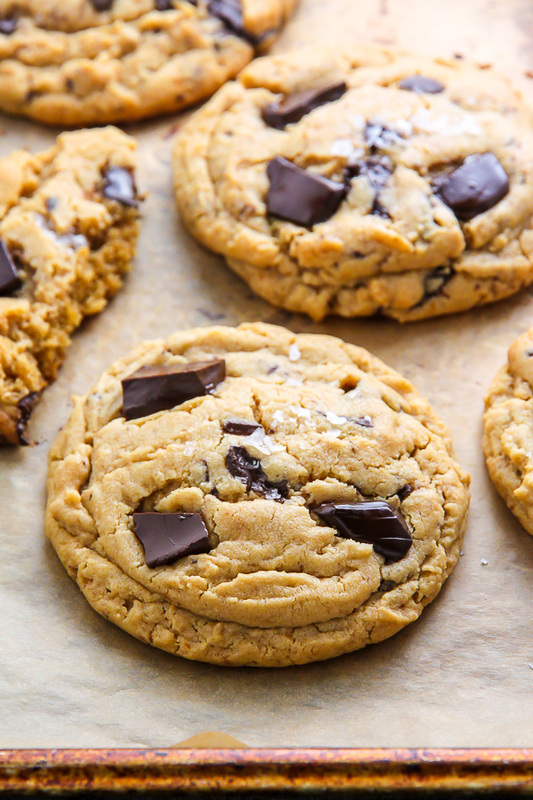 Ultra thick soft batch peanut butter cookies loaded with chocolate chunks! Perfect with a cup of coffee or a cold glass of milk. 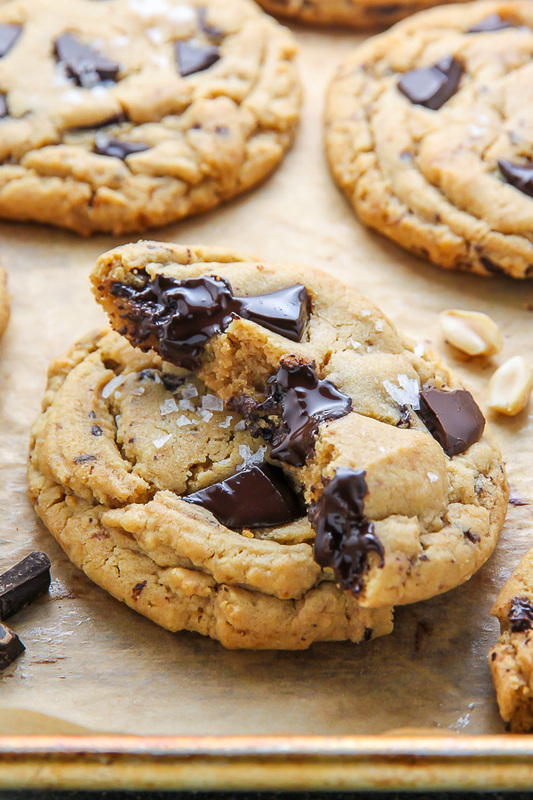 These are the best peanut butter choc chunk cookies! In the bowl of a stand mixer fitted with the paddle attachment or in a large bowl using a handheld electric mixer, beat the butter until smooth and creamy. Add in the peanut butter and vanilla and beat until smooth; about 2 minutes. Add in both sugars and beat until light and fluffy, scraping down the sides as needed, about 2 minutes. Add in the eggs, one at a time, beating well after each addition. Turn mixer off. Add in the flour, baking soda, baking powder, and salt. Whisk the ingredients together lightly before turning the mixer back on low and mixing in the dry ingredients until just combined. Be sure not to over mix here. Turn mixer off and use a spatula to fold in the chocolate chunks. Cover the bowl and place it in the fridge for 30 minutes, or up to 2 days. If you refrigerate the cookie dough for more than 30 minutes, you will need to bring it back to room temperature before baking. Preheat oven to 350 degrees (F). Line a large baking sheet with parchment paper. Scoop two tablespoon sized mounds of dough onto the prepared cookie sheet, leaving a few inches between each cookies for spreading. Bake for 12-14 minutes, or until the edges are golden and the centers have set. Cool cookies on the baking sheet for 5 minutes before transferring them to a cooling rack. The total time above includes chill time. These look so yummy! Thanks for the great recipe. 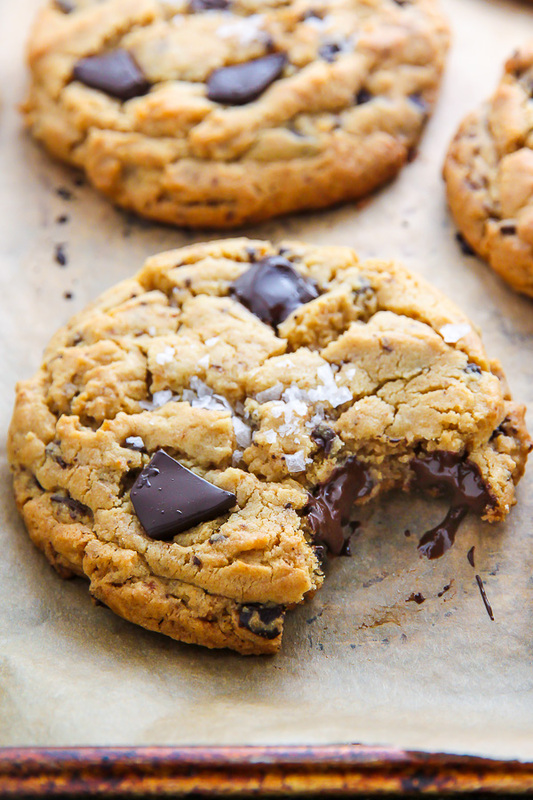 These cookies are the best soft batch chocolate chunk peanut butter I ever tasted. Thank you. These cookies look so good! Noticed when reading thru instructions there are 2 baking times shown – 9 minutes, then 12-14 minutes. Which is correct? Thank you! these look great!~ Cannot wait to try them! I think you’re going to love them, Jessica! Absolutely the best cookies I’ve ever made!!! I was out of baking soda so I added 1 1/2 tsp of addition baking power and didn’t add the salt. They are soooo soft and delicious!! Definitely a recipe I’ll keep! Yay! Hope you love them, Elvira. I finally got a chance to make these tonight and they are SO GOOD!! We can’t stop eating them! Thank you so much for the amazing recipe! This was my first recipe from your site and I am really looking forward to making lots more! I just made these. Another keeper recipe. Amazin!! Followed the recipe exactly. These look delicious and I cannot wait to make them this weekend! When do you add the sea salt? After baking? I didn’t chill the dough…. but they look amazing! I’ll see if it changes the flavor/texture of the cookies… but I doubt it! Can i leave them in the fridge overnight? What should i do next? Could I use chunky peanut butter instead, how different would it be in terms of the chewiness factor ? Hey has anyone tried making it without eggs. Any replacement. I am Vegetarian… Any suggestions would help… Really want to try them. These cookies look so amazing! So glad I stumbled apon this recipe! Just made these and they are great! I did not chill the dough as I didn’t have the extra time. Used semi-sweet chocolate chips. So good! So good! Used an icecream scooper and they came out nice, big, and golden brown. I did have to cook them for 16 min but they were well worth the wait! I really enjoy your recipes, thanks for sharing. Can I use peanut butter that has no added oils or sweeteners, just peanuts? Like the kind you would get from those machines at whole foods? 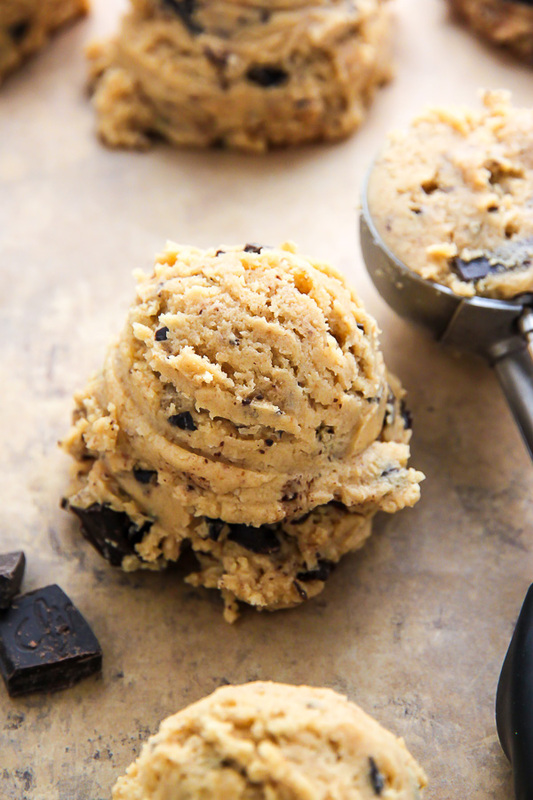 Can you freeze unbaked cookie dough? If so, how do you bake them from frozen? I use the the organic peanut butter that has the oil in it I have to mix. Did you use that kind of pb or the other? If i use the oily kind do i have to change the recipe at all? 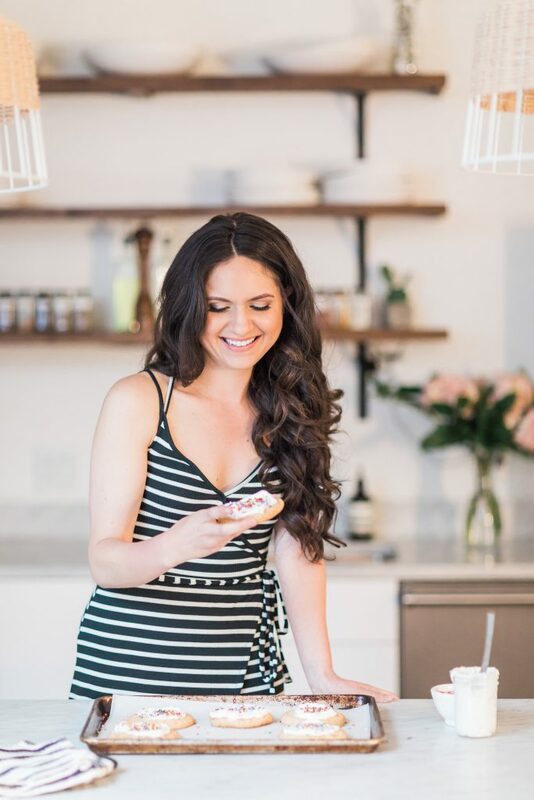 I really need to know soon…..does it matter if i use the natural, oil on the top kind of peanut butter…and if so do I have to adjust the recipe? Hi Terisa. I’ve only used no stir creamy peanut butter for this recipe, but I think the oil on top kind should work if you stir it really well so it’s combined. If that makes sense? There is a difference between natural and regular peanut butters…and it does affect the recipes. You should only use the regular peanut butter in this recipe. Did you end up trying the recipe? I made these for my boyfriend for valentines day and they’re amazing thank you! YAY! Lucky boyfriend 😉 Thanks for letting me know! Made these today,mine were burnt in d bottom n raw on d top.. while baking these cookies nly d bottom rods of d oven should b used or top n bottom,both? This is a delicious soft batch recipe! I can never leave a recipe alone though….I added a bag of toffee pieces and dark chocolate with caramel in it! Hi, what if I do not have parchment paper? Can I just grease the pan and will it be ok? Recipe looks great! Can I divide and freeze the dough? Hi Lauren. I haven’t tried freezing this dough, but I think it should work. I would scoop it onto a cookie sheet, freeze until solid, then transfer mounds to a freezer safe ziplock bag. You may need to add an extra 1 to 2 minutes onto the bake time. Can I replace eggs with something else ? I made these a few weeks ago and they got rave reviews!! Thank you!! 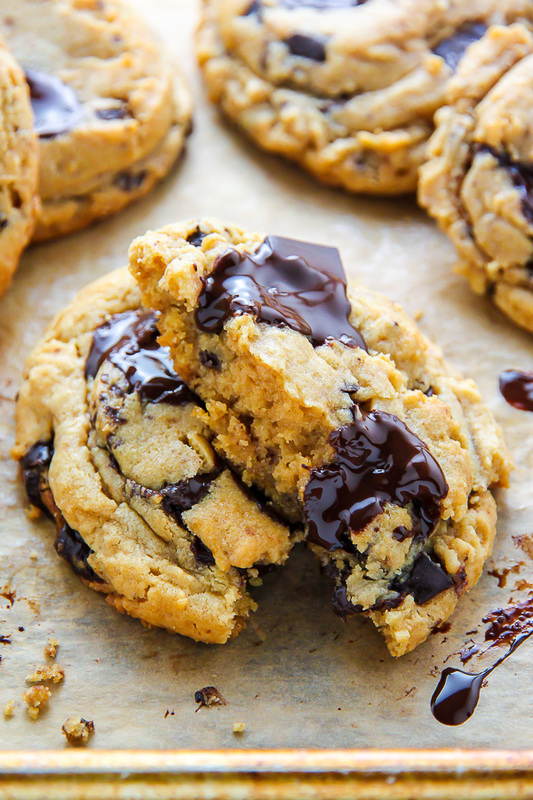 How do you get the chocolate chunks to be so gooey? Is it the chocolate you used? Did you do anything special in that picture with the oozing chocolate chunks? They look so delicious, I’ve got to try them! I made a little over 5 dozen decent sized cookies with this recipe. I didnt double it or anything, just followed the recipe to the T. Used coarse salt instead of flakes, tastes great. Thanks for sharing! Im going to have some people feeling lucky to be my friends soon!! So happy they were a hit, Jette! going to try these today! Granddaughter requested PB cookies w/chocolate chips as her special request for Christmas goodie mailing. ?? NEVER has MiMi made this SO after searching everywhere for a recipe I have decided on yours. Looks amazing and reviews are wonderful! do have a ? Does the salt go on before or after baking?? Plus- do you flatten before baking or leave mounded? I am getting the butter soft now I will appreciate your prompt reply. Thank YOU So much for your prompt response I will let you know how they turn out! I just made this recipe but mine didn’t come out like the picture. I’m not sure if I did anything wrong. I did use regular brown sugar instead and chunky peanut butter. But they are just flat and only slightly soft in the middle. Did I maybe mix the batter too much? Thank you ! Do you use natural peanut butter (the kind you have to stir – I like Whole Foods brand) or regular peanut butter? Also can you use crunchy instead of smooth. I use regular peanut butter 🙂 I think crunchy could work, but I’ve never tried so I can’t say for sure. DO you think I could substitute the peanut butter for almond butter as I have to consider some nuts allergies…. Hi I made these yesterday and I found that the dough was dry. So when baked they are not chewy. What else can I add if that happens again? can you use dark brown sugar instead ? So, I made this recipe. SEVERAL TINES! This is an absolute wonderful recipe! I made them to cater in for work during the Christmas month and EVERYONE absolutely loved them. 2 batches gone just like that lol. My 2 guys at home won’t let me forget that we have run out of cookies lmbo! Absolute perfection!!!! Ty so much for sharing this recipe! Hello ! I’m french so first, excuse my poor english. I’ve been looking for a long time for a cookie recipe that could make me feel baked in the middle of the USA. Thanks to you, there it is !!! ❤️ they are AMAZING !!!! À little taste of America in the middle of France ! How many gr aré 2 sticks or 8 onces?